Following a successful locally-funded summer park program reestablished by Friends of Brooklyn Park, Brooklyn neighbors celebrated the end of summer with the 17th annual "Ice Cream Social in the Park", on Sunday, September 9. The popular celebration is sponsored by the Brooklyn Action Corps neighborhood association, with help from volunteers. A variety of ice cream bars was offered for just 25 cents each. Local restaurant "Upside Down" was also in the park, selling three types of tacos, and canned soda for those needing extra refreshment. The afternoon afforded neighbors and families a chance to end the long hot summer with fun – raffle prizes, handmade jewelry, and music by the Yamhillbillies. Artichoke Music offered free lessons on various stringed instruments; a 5-in-1 Jungle Air Bouncer provided excitement for kids. BAC stalwart Marie Phillippi told THE BEE, "Initially, there was a problem with electricity at the park today, but luckily a neighbor on the hill provided connections for us." While neighbors caught up on each other, there was much chat about new construction in the neighborhood, along with issues of traffic, parking, and break-ins. Bar 33 and the Community Garden tool shed were both victims of recent break-ins. Neighbors were also concerned about encroachment by an increasing homeless population, troubling local levels of diesel particulate emissions, and more frequent sightings of coyotes. Earth Fairy Entertainment did a brisk business in free face painting, with touches of glitter paint. 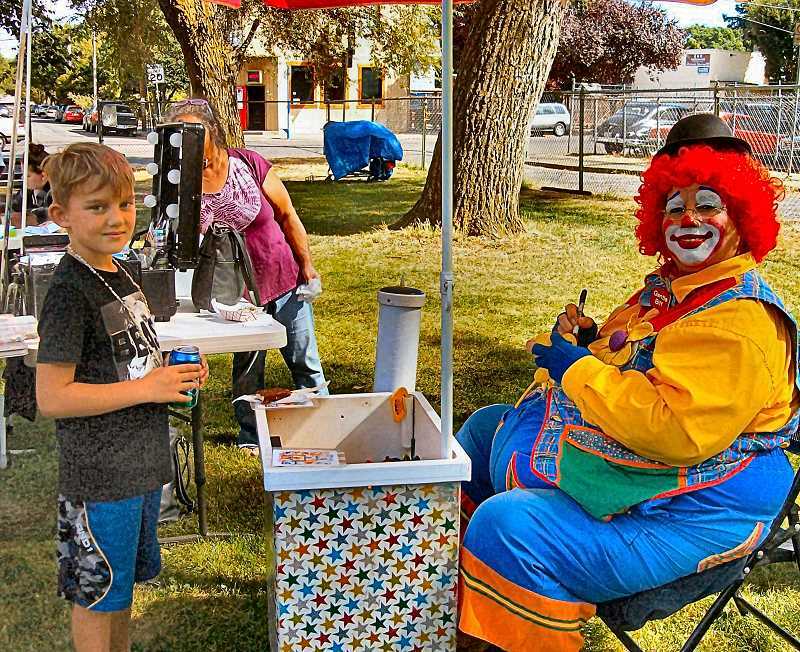 Event regular "Biff the Clown" made free balloon sculptures, and volunteers from Sacred Heart Catholic Church handed out colorful balloons weighted down with small containers of bubble stuff or juice. A Girl Scout from Troop 45502, 14-year-old Charlotte Deibele, displayed a variety of wooden nesting boxes to attract pollinators, such as solitary bees and bumblebee colonies. It wasn't all just frivolity. There were booths for the Brooklyn Historical Society and the Brooklyn Community Garden. Melaney Dittler from Windermere Realty provided fliers for an upcoming Brooklyn Historic Walking Tour. Guy Berliner managed a Plant Swap station next to Barbara Mohl of the Brooklyn Community Garden. Adjacent to the Yamhillbillies, new artist Jes Ludwick performed open-air painting and live expressionist dancing in costume. BAC member Mark Romanaggi praised the newly-reactivated Greater Brooklyn Business Association's members for many donations of raffle items and gift certificates. "About two dozen local merchants provided in-kind certificates." Kudos were also given to the GBBA for their August 9 public inaugural event, the "Best of Brooklyn Business BBQ", held at S.E. Milwaukie Avenue at Franklin Street and hosted by US Bank. But in the end, the afternoon was all about inexpensive ice cream bars and family fun.